So now you are ready to finish your quilt top, that’s great news. You should give yourselves a big pat on the back. In part 2 I showed you how to add a border and prepare your quilt for quilting. This is how the quilt top would look like once you have pinned it ready for quilting. Step 1: Planning – Before you sit down to quilt you need to have a plan on what you want design you want to quilt and the method you want to use for quilting. The three methods I know are hand quilting, free motion quilting and quilting whilst using the walking foot. I won’t be able to go into great detail for each method, for that I will ask you to do your own research on the net. Step 2: Drawing your design on paper – As shown below draw your quilt top on a piece of paper and decide what you want to do. I am choosing a maze design on each of the blocks we have made, however in the middle where the butterfly is I will be using the free motion quilting method and then I will finish off with straight lines on the border. Step 4: Attach your walking foot to your machine and get ready to start quilting. I will first start by stitching in the ditch. That is securing my quilt by stitching along the seam lines. When doing this make sure that you continue to flatten your quilt piece and ensuring the backing fabric is absolutely flat too. Tip: Please note that you don’t have to quilt in one go, you can stop and start. However, if you do decide to stop make sure that you neatly finish off the thread as shown below. Step 5: This is how your quilt will look once quilted. Once you have completed quilting cut off the excess fabric and neaten the edges. Make sure you have secured all your loose thread ends and your quilt is ready for binding and labeling. Other quilting resources can be found on my “Free Motion Quilting Fun” page. Step 6: Binding your quiltFor binding your quilt please have a look at this amazing you tube video to learn how to bind your quilt. Once you have finished binding your quilt you may want to label your quilt. After all you have put considerable effort in making it. 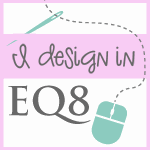 I have included a link on how to make your quilt label. and there you go you have successfully made your own sampler quilt. Note for course participants: all the course material produced for this course is the property of No 3 Quilt Studio. Please ensure that this material is not distributed without my permission.